On Wednesday night there was a lunar eclipse. It's was really cloudy here so we couldn't see it, and the next one won't occur until December 21, 2010. On Thursday, people were surfing the web looking for images of the eclipse. 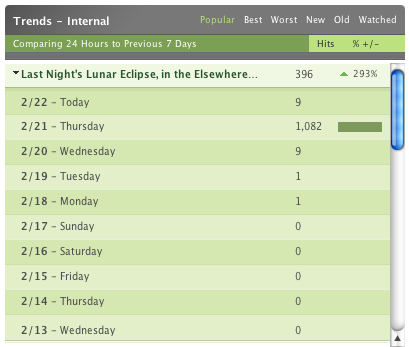 A lot of people found my photos from the lunar eclipse on November 8, 2003. That long-forgotten page received over 1,000 visits yesterday!